If you need motivation to work out or to stay on track, Exercise Motivational Poster Print has funny quotes to help! 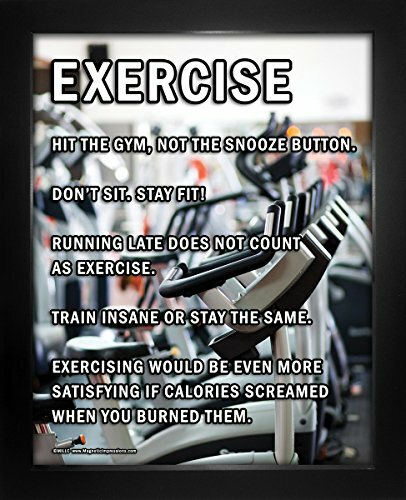 "Hit the gym, not the snooze button," is a great saying on this workout poster. Fans of fitness and healthy living will love this motivational exercising gift. This product is printed on high quality thick glossy cardstock and is made in the USA. Poster comes in a sleek black wood frame to complement the image. Poster features inspirational and witty workout quotes like, "Running late does not count as exercise"
If you have any questions about this product by Posters and Prints by Magnetic Impressions, contact us by completing and submitting the form below. If you are looking for a specif part number, please include it with your message.